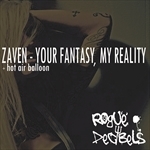 Dutch producer & Batavia Records boss ZaVen steps up to deliver this rich, deep exploration of sight and sound, albeit with a sleazy twist on the hot and suggestive title track, Your Fantasy My Reality. Its all revealed in the unfussy yet punchy drums, robust bass and wash of sound effects plus electric piano chords that generate an accomplished musical backdrop to the breathy, enticing vocals that feels reminiscent of classic 1990’s House (in a good way). Hot Air Ballon, then completes with more atmospheric sounds amid pointed beats and inviting hints of melody which once again rush over you in a most welcoming fashion.